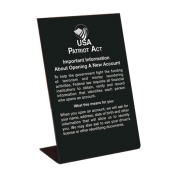 Easel style signs are perfect for teller areas, reception desks or customer counters and meet Federal Reserve Regulation requirements. Two versions of standard copy available. Copy # 1 refers to Important Information About Opening A New Account...To help the government fight the funding of terrorism and money laundering activities, Federal law requires all financial institutions to obtain, verify and record information that identifies each person who opens an account...Copy #2 refers to Customer Identification Requirements...In accordance with Section 326 of the new USA Patriot Act, applicants for new accounts are requested to provide current picture identification that verifies identity including name, address and other identifying information... Copy of full text available via fax upon request. Signs are made of durable plexiglas in black with white letters. Size: 6 x 9.